Holi, the festival of colours, also known as Vasant Utsav, is celebrated with a lot of energy and enthusiasm each year. People of all ages play with colours and make merry to welcome the spring season but there has been rising concern in recent years about the colours being used during Holi. 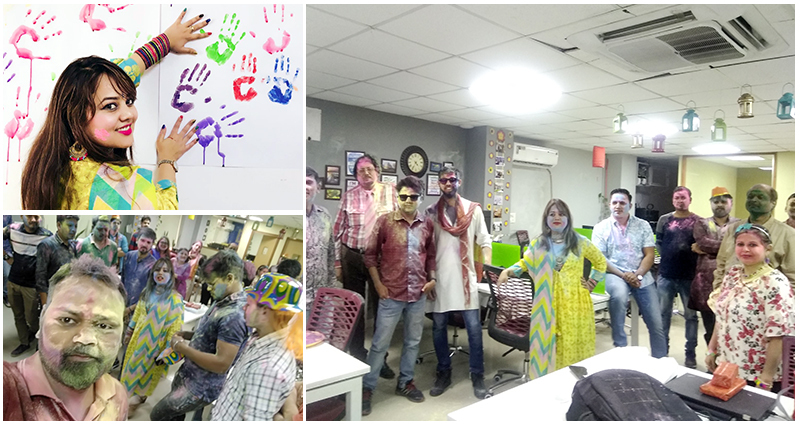 At Limitless Mobility, a tech company, based in Noida, India, the team decided flag the issue of unsafe colours being used and encourage people to play Holi with safe organic colours. They created a witty skit to convey the message that playing Holi with adulterated colours containing harmful chemical dyes can have serious health implications. Most people like to let their hair down during Holi and indulge in merry making with colours. That’s fine but when it comes to the colours they play with, some serious questions arise because every year after the Holi celebrations are over, scores of people in different parts of the country end up with skin and eye problems. A majority of these incidents don’t even get reported because they involve people who don’t have the means to pay for their treatment and suffer silently. Even for those who can afford such treatment, it is necessary to realize that prevention is the best cure for Holi related skin and eye problems. It can be a little intriguing at times to see people not ready to acknowledge something as obvious as the dangers of skin and eye damage due to use of colours dyed with harmful chemicals. Holi is seen as the only day in the year when people take a few liberties and the common refrain is – “Today is Holi…let’s set the rules aside”. What such folks need to understand is that this is less about rules and more about basic precaution. Therefore, any message to discourage people from exposing themselves to such dangers must convey that do everything you do with colours but do it with organic colours. The other important message for Holi revellers is the need to avoid wastage of water, which has become a widespread issue during every Holi. Some folks like to stretch their idea of making a lasting impression during Holi and mix the dyed colours with water so that it remains on the skin and clothes for weeks if not months. Such extremes need to be checked because this is anything but Holi in the true spirit of the festival. Moreover, it leads to massive wastage of water not just while playing with wet colours but also while cleaning up after the festivities are over. All such wastage of water could be avoided if Holi is celebrated just with dry colours that are organic and safe. The team at Limitless Mobility are quite conscious of their responsibilities toward the environment and eco-system and are involved at several Green initiatives at the team level. They are making a difference with their commitment where it counts most – the individual level. They created this skit to convey the message that when people sit down and discuss a serious problem, solutions are easier to come by.